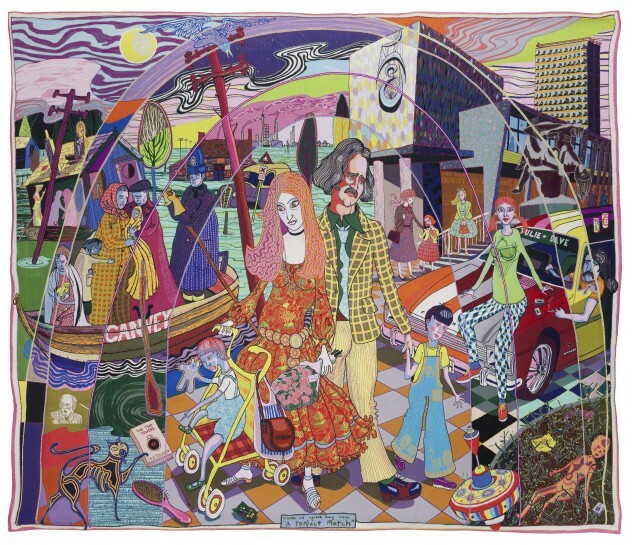 Perry's Julie Cope’s Grand Tour will go on view at Dovecot Studios (25 July–25 August 2019). The exhibition, which is the final stop of Julie Cope’s Grand Tour, includes the complete series of tapestries and a selection of artefacts from A House for Essex, an installation designed by Perry with FAT Architecture to evoke a wayside pilgrimage chapel, which – instead of a patron saint – is dedicated to the life of Julie Cope, a typical Essex woman. Courtesy the artist, Paragon Press and Victoria Miro, London/Venice.